I have this one window on the South side of my house. It has begged for a kitty to lie in its sunshine since the day we moved in. Yesterday two kitties moved in…and today one moved into my sunny patch. This is Percy. He’s 2. He’s bonus kitty to clearance kitty. Clearance kitty is the one that won me over in his adoption profile. He’s four. He’s a polydactyl, which means he has extra toes on his front paws so it looks like he has mittens. It’s amazing. He’s missing the tip of his left ear too. 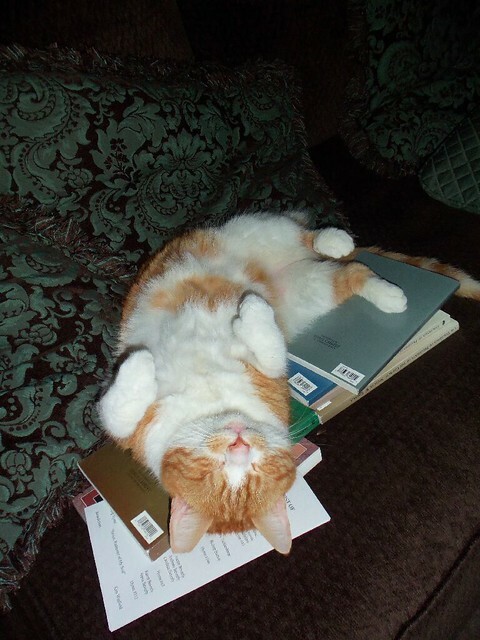 He also only has one eye, which is hard to tell because he’s all passed out asleep on top of church books. It was surgically removed in early July and he has been at the Human Society ever since. Now he’s our one eyed, five toed, licking furry kibble eater. We named him Wink VanGogh. You can just call him Wink. He’s still pretty shy until the little humans that live here are in bed. He also mrows a lot. Mrow, mrow, mrow, mrow, mrow, mrow…I missed kitty mrows. And the kneading! Oh…he gets comfy and those extra toes go into action mode. And Percy? He’s a lover. I didn’t think I could get happier. Rescue pets will love you better. @samantha jo campen, Addie’s first fur love was a blind Dalmatian. It’s in our nature as well. Rescue/adoption pets are the awesome-est. We got Dungy two years ago. He came all the way from Indiana. We love the big dawg. The Dunge. Dungy-Doo. Congratulations! @Angie, As in Tony? Because that’s divine. Rescue pets are the best. Both of my cats are from Indy Humane, and they make life so much better. Congratulations. @Allison Carter, I swear they need a permanent rainbow installed over Indy Humane. OMG. 1 – best names ever (not that this surprises me!). 2 – rescues rock. BTW, It’s already snowing at my house (!!) and this made me fell warm and happy. YAY! @Beth, When it snows here I’ll have cats to SNUGGLE WITH! @Casey, Cat snuggles in the snow are the BEST! Awesome, I just adopted from IndyHumane last March. Dobby was feral for three years until captured, treated, and put up for adoption. He’s the most social cat I’ve ever seen in my life. I had pets from the time I was born until I moved out at 18. I needed something in my new home. Haven’t regretted it once. @Jake Hamilton, It’s like a pay it forward chain of love. You, Shireen, me…and four very happy cats. Sunshine AND kitties? I love your life! @Joules, Seriously. I took a few hits off the warm kitty fur today. Wink made me gasp. He looks JUST LIKE my kitty from growing up. I named him Punkin when I was 5. He had a torn ear and would sit on my luggage every time I packed to go back to college. Your little girls are so lucky. @Jamie, Addie wanted to name him Stripesey. I had to put the kibosh on that one. And he could be around when she goes to college! WEEP! So awesome! I love that you adopted two so they each had a pal. @Karen Sugarpants, You need to come back so you can meet them. They said so. @Karen Sugarpants, They also want some of that “Canadian” Cat Nip. Hanging out at your house just got 40 toes more awesome. @Just Shireen, 38. I googled it. This post made me smile so hard I cannot even explain it. Rescue cats are the very best, I’m not sure who I’d even be without ours. @Overflowing Brain (Katie), Go figure you finally get your baby and I get my cats. That’s awesome! They’re so cute! Congrats to them and to you guys. I have two rescue cats myself, and one is a poly too. I love his paws! He’s currently on my bed in the sun, just where a cat should be. Life is too empty without cats. @ccr in MA, They really should have been here all along. I love your kitty names. There is nothing quite like a warm, furry cat purring contentedly on some part of your body. Enjoy all the happy. @Ami, Well, except for your face. That one can get awkward. Looks like they found the purrrfect home! Enjoy! @Shan, Took restraint not to name Percy, Purr-cy. Percy looks like my kitty except Everest has a white spot on his back and Everest is just about as big as Percy is, too. Huge kitties are the best! And Wink’s missing ear tip means he was brought in as a stray once upon a time and neutered. We did that to two strays and they dock their ears so if they’re caught again and brought back in they know that they’re already spayed/neutered. It’s relatively painless for the kitties and a good way to keep track. So happy for your new extended family! Oh, and I’m so jealous of the polydactyl. I want one so badly, but now that we already have two kitties, we’ve hit our limit. Boo. I’ll have to settle for visiting the Ernest Hemingway House in Key West. It’s filled with polydactyl cats! @Katie, My sister has always wanted a poly too. I guess she gets one for a kitty nephew. Congrats on the kitty loves. I love your kitties. We have two little orange ones that are full of loves. We don’t see ours much with the little’s running around. @saramd, Percy doesn’t mind Addie, Wink is a little skeptical of her, both of them like Vivi a lot though. @To Kiss the Cook, HoneyCat needs a friend. She told me. Percy & Wink are great names, but I’m a little surprised you didn’t name one of them Perry. @mommabird2345, Perry is going to be for our pet platypus. You know, when we get one someday. I LOVE cats. I was devastated when Louis died a month ago. He was my BFF for the past 17.5 years. And now? This pregnancy has made me allergic to cats. But I vow to be a kitty momma again in the future. @Katie, Dude, to think that these critters could still be around to see Addie off to college? Makes my head spin. I made my mom allergic to cats too, she’s not very happy about it. OMG They are the cutest ever! What is it with bloggers adopting cats with extra toes? Didn’t the Bloggess do that too? Maybe we’re attracted to it or something. If my husband and FIL weren’t allergic, I would so get another cat. I miss kitten snuggles. @Untypically Jia, She did just get a poly, we like the busted kitties. Oh happy rescued kitties! Every house needs a cat (or three if you come to our house). Congrats on your new family members! @Kassandra, Thanks! I could have adopted every single cat there. 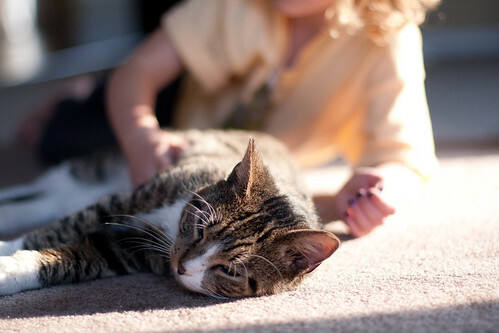 I’m allergic to kitties, but love that you have rescue animals – because they need love the most-est! I’m so so happy about your polydactyl. We had one that we just recently lost and he was the love of my life- aside from my husband, of course. There’s just something about those huge hands. Amen. Rescue pets are the best. Love all the love happening in your life. Congratulations. Your Karma just went up 25 points. Its always good to adopt two pets if you can. They keep each other company, not that they wont keep you company too. I truly believe animals make us better humans. Plenty of advice out there on raising cats if you need any. Just ask. Thanks for writing your stories. They bring me joy. A kitteh. I wants wun. But I can no haz. I am going to go cry into a saucer of milk now. Everyone looks so happy. Clearance kitty looks like he came home and that was that. Love love love the kitty cats. I have one that hangs his behind over my shoulder too. I love this! It is so great you decided to get adult cats. You have a good heart! MY in laws had a multi-toed cat who was orange with one eye too! Mo-Toe (yeah, my father in law went there) lost his eye to a fight. 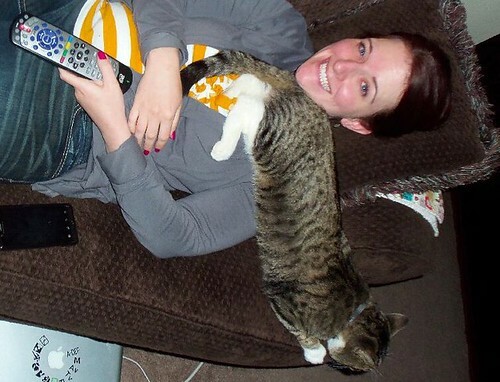 He was the sweetest cat evah! I remember Wink very well. I’m a volunteer at the shelter and it’s so nice to see how much the cats are loved once they get a new home. I’m so happy for Wink, Percy and your family. Thank you.